Anti-access/area denial (A2/AD) bubbles are emerging around the world, including in the Black Sea. They can alter the security equation and weaken the Western deterrence capital. How will the NATO alliance choose to respond to these new emerging trends in its near abroad? What is the appropriate military and non-military response to hybrid warfare? A hybrid warfare calls for a hybrid defense, and hybrid defense requires also non-military means: a whole-of-government approach, a mix of soft and hard power tools, civilian and military cultures, state-centric and private (NGOs and media) instruments, in order to minimize opportunities already in-place that a foreign power can exploit to its advantage. Crimea and Eastern Ukraine are the battlefield for a different type of war: non-linear warfare that uses insurrection – a direct influence of Evgenyi Messner’s writings on Russian contemporary military thinking. 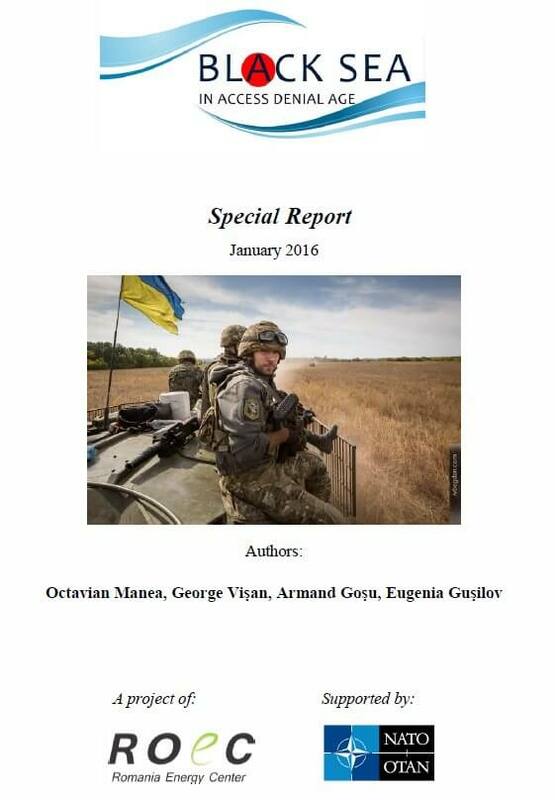 This Special Report focuses on three dimensions: implications of Crimea’s militarization for the Black Sea and NATO’s potential offset strategy, implications of hybrid warfare, and economic implications of the new geopolitical layout in the Black Sea (in particular, upstream access denial for Ukraine). Chapter 1 discusses the emerging anti-access/area denial (A2/AD) challenge in general and in the Black Sea, in particular, and how these trends affect the NATO homeland. Deterrence is changing and traditional military advantages can no longer be taken for granted. The assumptions of the 1990s, made in a fundamental unipolar security environment, have led to a defense in-depth posture based on expeditionary power projection. That reality no longer holds as emerging anti-access/area denial (A2/AD) essentially alter the fabric of the security environment in which NATO operates. The chapter offers a detailed account of the A2/AD hardware that Russia is deploying in Crimea (ground, air, and sea components) and tracks the current state of the debate on A2/AD capabilities within the Alliance itself. NATO’s post Crimea slow motion pivot to the Eastern Flank will have to effectively address the rise of A2/AD threats or face the consequences: a weakened deterrence at its periphery. Chapter 2 discusses Russia’s psychological warfare in Ukraine – a war of ambiguity where the prize is not territory (ground, air or sea), but a fourth dimension – the minds of the people. The aim of this way of war is to induce panic in the enemy’s mind, mistrust of leaders, doubt in one’s own force, opinions, feelings, collapsing the morale of the troops and population. According to this new type of warfare (inspired by the 1960s writings of White Russian colonel Evgenyi Messner), there is no front line, war extends to the entirety of the enemy territory, because it targets the minds of the people in that state, and not their territory. Western experts call it ambiguous warfare, insurrection war, or non-linear war. This non-linear warfare builds on some of the pivotal trends that defined the post 9/11 security environment in the sense that the ideal incubator for this type of violence is the weak and fragile state, the state that has a dysfunctional and corrupted administration. Ukraine is a case in point. The bigger the societal fault lines and economic disparities, the better the opportunities for fomenting an insurgency and waging a non-conventional war. Therefore, the best counterinsurgency policy, is nothing other than good governance. Chapter 3 explores the economic consequences of Crimea’s annexation zooming in on dynamics in Ukraine and Russia. Despite the fact that economic issues took a back seat to security and military concerns, the implications on this level are huge. Ukrainian gas exploration and production projects that were in the pipeline are now in limbo, de facto frozen indefinitely, while sorting things out in courts may take years. If there ever was an ulterior energy motive for grabbing Crimea, it was not because Russia needed the shallow waters gas (2 Bcm/year production), more likely it was to deny the untapped deep water potential of the Ukrainian Black Sea shelf to Ukraine, and therefore keep it a captive gas consumer forever. Crimea’s annexation and subsequent military build-up created a reality so hostile that no investor can go there. Deliberate strategy, perfect storm, or unintended consequence, the main outcome of the March 2014 annexation was upstream access-denial to Ukraine’s most promising untapped hydrocarbon areas. In this context, Russia has developed a capable arsenal of A2/AD weapons systems and vectors, process which is likely to continue in the medium and long term. The Kremlin is employing this arsenal in order to compensate for its overall military weakness in relation to NATO and the United States. Russia aims to exploit the relatively few military weaknesses of the West in order to create political facts on the ground and splinter the alliance since the A2/AD arsenal can be used both to interdict and delay the deployment of U.S. and NATO forces in defense of one of its members situated on the Eastern flank. When Russian AD/A2 weakens NATO’s deterrence, what can or should NATO Black Sea countries do to optimize their position? On the other hand, what could the Alliance as a whole do to fix this new breach in its deterrence capital? Is a new offset strategy a possible answer? Our special report is trying to explore this missing piece of the puzzle.